AFRAID YOU WON'T GET YOUR SET BY CHRISTMAS? 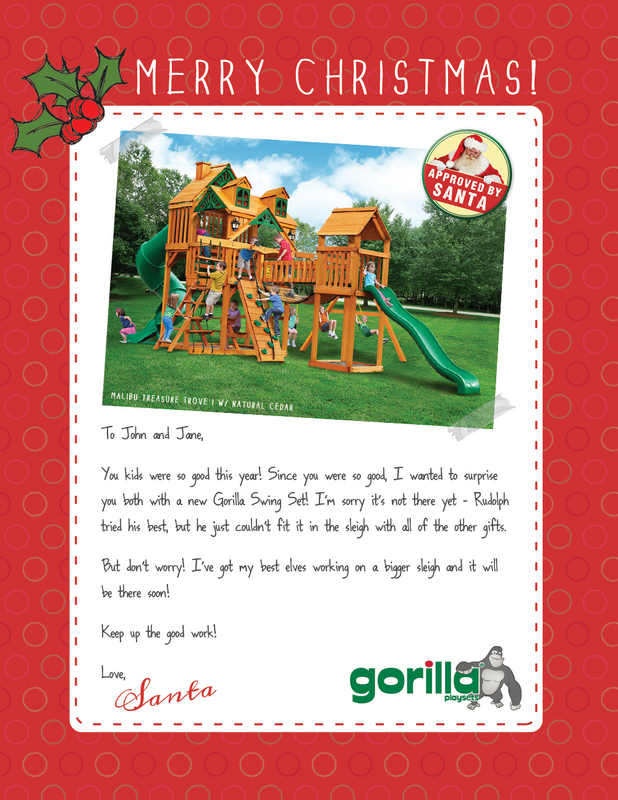 Although you may not have your swing set Christmas morning, you can still build your children's excitement about their new set with a personalized Letter from Santa! Santa’s letter includes a picture of the set they can expect to play on for years to come, along with a personalized note from Santa! An example of our customized Letter from Santa is shown to the right (click to view larger). In order to create your personal Letter from Santa, we'll need some information from you — please tell us your children's names and gender in the 'Comments' field on your order page. If you have any questions, feel free to call us at 888-895-1181. Once your order has been received, we'll get our elves to work creating your personalized letter. The final letter will be emailed to you to print.